Sweep (or seep) is a popular Indian card game played with four people divided into two-player partnerships. The partners sit across the table from each other. The game uses a standard 52-card deck (the jokers removed). 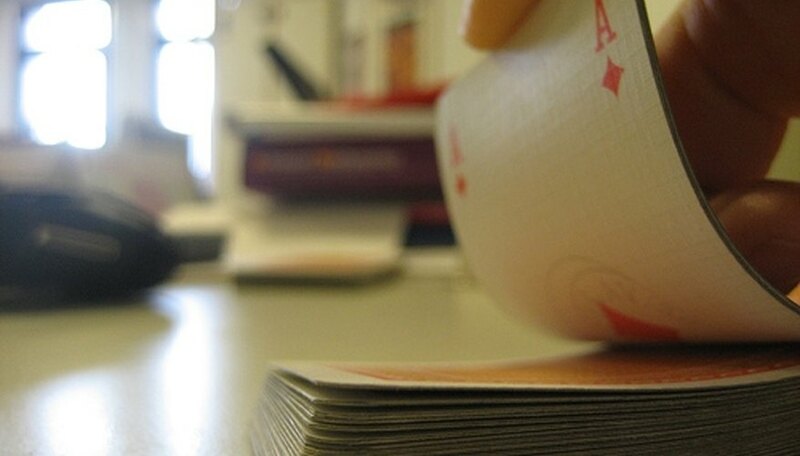 All cards are played at face value for each hand, regardless of suit. For instance, each ace is a 1, each four is 4, each jack is 11, each king is 13. However, only the following are actually worth points when scoring at the end of a hand: All spades are worth their face value. For example, a king of spades is 13, a queen is 12, and so on down to the 1-point ace. The 10 of diamonds is worth 2 points. The other three aces also are worth 1 point each. Choose a dealer at random (or draw and let the player with the high card deal). Deal four cards face-down to each player in counterclockwise fashion (the player to the dealer's right--whom we'll call Player A from here on--gets the first card, and so on). Everyone can look at his cards. Player A goes first by announcing a number between 9 and 13 that corresponds to the point value of one of his cards. For instance, if he has a jack, he can announce "11." If he has more than one card worth nine points or more, he can choose from them. However, if he has no cards worth nine or more, the dealer must re-deal. Once Player A is able to announce a number, the dealer lays four cards face-up on the table. Player A then has the opportunity to lay a card from his hand onto one of the four on the table. To do this, he must lay a card down that, when added to the card on the table, totals his announced number. For instance, if he has a nine in his hand and there is a two on the table, he can lay the nine on it to total the 11 that he announced. If he cannot put a card from his hand onto a card on the table to equal his announced number, he must lay down one of his cards onto the table, face-up. Play passes to the right. From the first play on, each player attempts to build "houses" of cards or take a trick (picking up a house already built). To build a house, a player places a card from his hand onto a card on the table. A "house" must always add up to between nine and 13, and must total the value of a card in the player's hand. For instance, if there is a three on the table and a player has both a nine and queen in his hand, he can lay the nine on the three and announce "twelves." He has to wait until his next turn to take the trick (pick up the house), if it's still there. Houses can be picked up by any player once they are built, unless they are cemented (explained below). For instance, if Player A builds twelves and Player B has a queen in his hand, he can take the house built by Player A. Houses can also be raised higher by adding smaller cards onto them. For instance, if a twelves house is built, a player can add an ace onto it to build thirteens. Again, the player adding the ace must have a king in his hand (to equal 13). Houses can be cemented by a player putting a face card equal to the house value on top of it. For instance, if a "twelves" has been built, a player can lay a queen on top of it to cement it, so that only a queen can take it--it can no longer be raised by a smaller card. The player doing this cementing must have a second queen in his hand before he can do it (in other words, he must be able to pick up the trick). On his turn, if a player cannot pick up a trick or add to or build a house, he must lay down one of his cards face-up on the table. If at any point no player can add to or build a house, the hand is over and all remaining cards go to the player who took the last trick. Partners then add together their point cards (see the Section 1) for a team score. The team that took the most cards in the hand gets an extra four points. There will be a total of 100 points divided between the two teams (though it is possible for one team to collect all the points). Most sweep games are played until one team scores 500 points or more, but this is arbitrary and can be determined by the players.